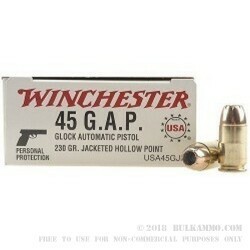 A premium self-defense ammunition for the shorter .45 caliber – 45 GAP. This is the .45 GAP’s mainstream personal defense load that allows a shooter to play around at the range with the same ammunition they carry, or a substantially similar version to it. This is a 230 grain jacketed hollow point load by Winchester in the Winchester White Box variety. Winchester has secured itself a nice piece of market real estate here, with production allowing for good pricing on a round that shooters who are dedicated to the platform will be buying for many years. There aren’t a lot of competitors for the Winchester brand in this market segment with the relatively small number of users for the .45 GAP. They are the single manufacturer that is producing 50 round self-defense packs of jacketed hollow point ammunition at this price point. For the dedicated shooter of .45 Glock Automatic Pistol rounds, this is a great opportunity to stock up on ammunition at a great price by a legacy manufacturer that “gets” your needs as a shooter. 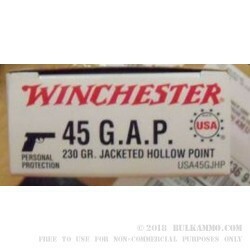 This is a .45GAP load that features a 230 grain JHP projectile in a brass case with a Boxer Primer.